Travel to Les Écréhous National Park by charter boat to experience the islands with a local guide who’ll unveil the history and marine life of this extraordinary place. We’ll explore the hidden spots and share stories of French invasions and the hermit of Les Écréhous. Amble between old fishermen’s cabins on La Marmotière and cross sandbars, which are usually submerged beneath metres of ocean. Perhaps see dolphins and seals en-route to the archipelago. Private charters on other dates can be arranged. Book online. 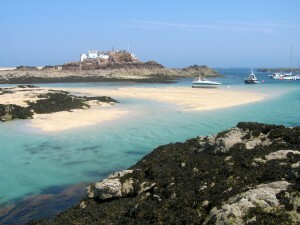 Dates of all our seabed walks are listed in our Walks diary. Grade of walk: 2 miles (3.2km) Moderate. Expect to walk over uneven and rocky terrain.